Intended for novice daily fantasy sports players, this guide will walk you through the basic strategies that will help you learn how to win playing daily fantasy NFL on DraftKings. 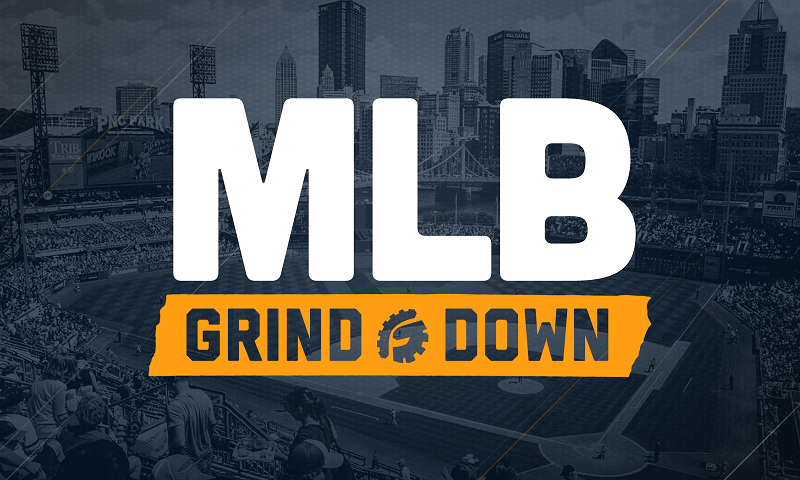 If you haven’t yet created a DraftKings account be sure to use our Promo Code RotoGrinders to get 3 months of our DraftKings premium product for free! ($75 value). DraftKings is a major player in the daily fantasy industry, and their NFL leagues in particular have handed out some of the largest prizes in daily fantasy sports. Due to their attractive interface, unique league types, and flat tournament payouts, DraftKings is quickly gaining market share in the daily fantasy space. If you want to be successful in your DraftKings NFL strategy, you need to implement strategies that are specific to the site. That means understanding little nuances about DraftKings fantasy football strategy, such as how their starting requirements or long-term pricing trends should affect your play. Note that the content below is intended for novice daily fantasy players. 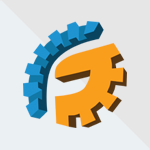 If you have daily fantasy football experience, be sure to check out our more intermediate and advanced material on the “Free” tab at RotoAcademy. The NFL section is split into Undergrad, Masters, and PhD sub-categories. There, we walk you through topics such as building a foundation of NFL research, using the Vegas lines to help you pick players, understanding game variance, and the best approach for winning tournaments. Just use the search box for your topic or click on the “Free” tab in the blue header on RotoAcademy to take advantage of all of the free, in-depth content. Editor’s Note: Don’t yet have a DraftKings account? Click here to create one and receive a 100% deposit bonus. Not only will your first deposit be doubled, but you’ll also receive free access to our premium DraftKings strategy content, which will build upon the guide below. 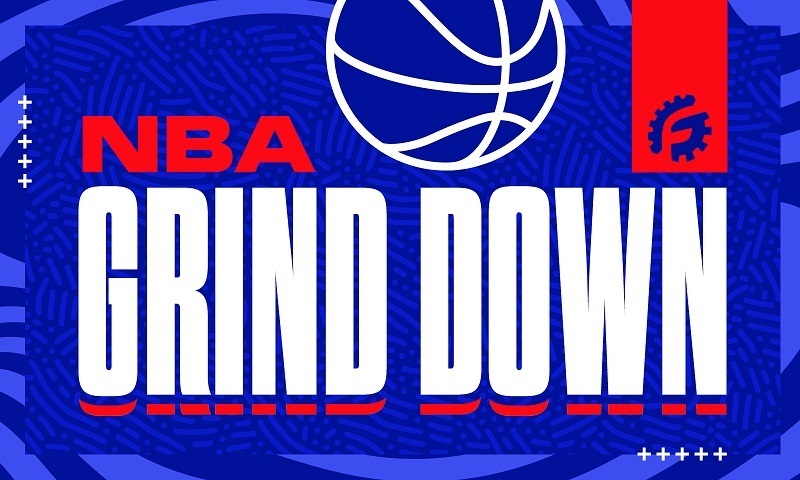 Create your DraftKings account now! On DraftKings, you must start one quarterback, two running backs, two wide receivers, one tight end, one flex, one kicker, and one defense. 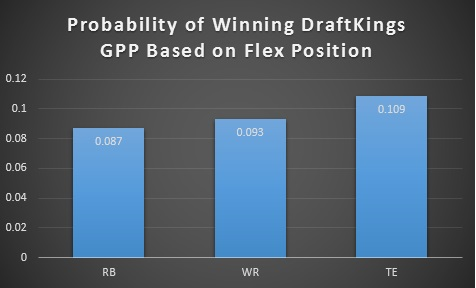 The flex position is the most important here because it represents the largest potential advantage for daily fantasy players. Many people approach the flex position with the wrong strategy. The flex position is so important because it represents options. You can play a running back, wide receiver, or tight end in the flex, which ultimately favors the best players. Those who put in the research time will be able to compare players at different positions more easily, giving them an advantage at the flex spot. The key to understanding how to handle the flex position is knowing DraftKings’ scoring system. Namely, it’s crucial to incorporate the site’s full PPR (point per reception) scoring. Because every catch is worth one point, the value of wide receivers increases dramatically. In most cases, wide receivers (or even tight ends) actually make for the best flex plays on DraftKings because they score the most points relative to their salaries. Most novice players use a running back in the flex, however. That’s probably not the right play most of the time in DraftKings tournaments. 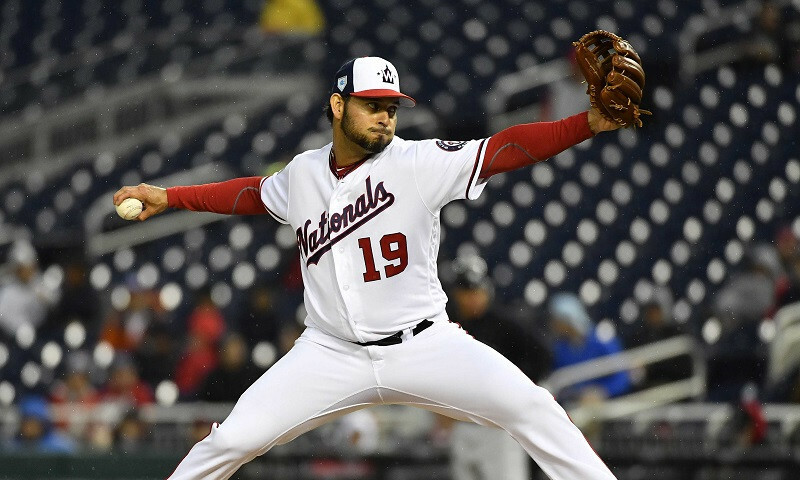 The top DraftKings tournament teams are those that use a pass-catcher in the flex. In tournaments, you need a lineup with a lot of upside, and wide receivers/tight ends just have a lot more upside than backs in full PPR formats. In head-to-head leagues, though, safety is key. Running backs are more predictable than pass-catchers from game to game, so they’re very usable in the flex in head-to-head or 50/50 leagues. The key is understanding what you want out of your lineup and how to use the flex position to achieve that goal. 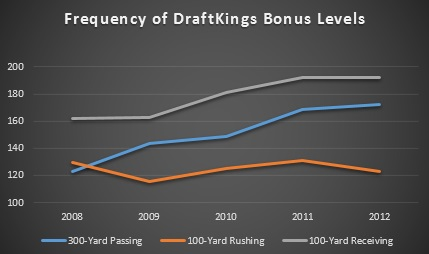 Another aspect of DraftKings’ scoring system that’s important to understand is the bonus structure. The site gives three bonus points for 300-yard passing games and 100-yard rushing/receiving games. That gives a little extra value to elite players who consistently top those marks, particularly at the quarterback position where production is pretty consistent. Below, you can see how bonus level achievements have changed over time. Whereas the number of 100-yard rushing games has remained steady, there are more and more 300-yard passing games and 100-yard receiving games each year. Again, that favors elite quarterbacks, but it’s also a reason to stick a wide receiving in the flex. The elite options will hit the 100-yard mark more consistently than running backs, which gives them a combination of a higher floor and higher ceiling. Wide receivers are more valuable than running backs on DraftKings not just because they can score more points, but also because they cost less money. It’s important to understand that value is completely dependent on price, so if DraftKings were to change the way they price players, the values would change. Historically, though, DraftKings has priced wide receivers and tight ends lower than running backs, even in relation to their projected points. On a position level, their salaries are usually pretty accurate, though, i.e. they price running backs fairly in relation to other running backs, for example. 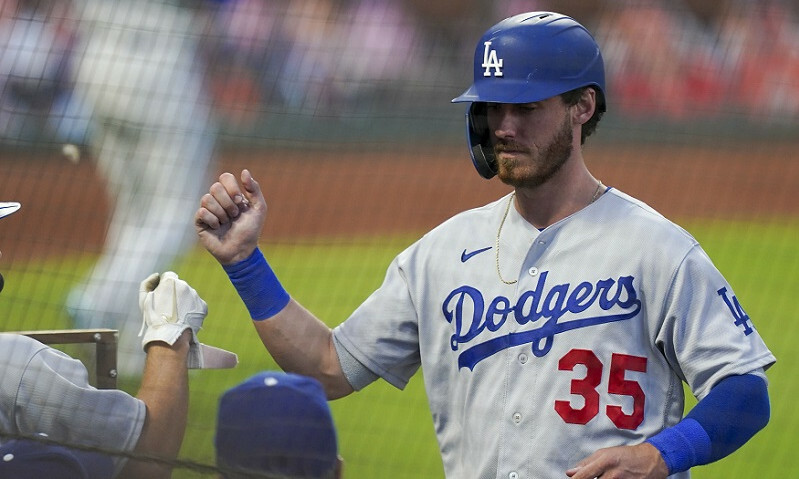 There’s usually a pretty big gap between the lowest-priced players and the highest, which means it’s valuable to play backups who get thrown into the starting lineup. If a running back gets injured during the week, for example, his backup will usually cost very little and offer great value on DraftKings. Regardless of the specific league types you prefer to play on DraftKings, you need to tailor your lineup to match. Head-to-head leagues require consistency, while GPPs require upside. One way to increase upside is to stack teammates, also known as “handcuffing.” There’s an entire post on NFL handcuffing in RotoAcademy, showing you how specific player pairings can increase upside. If you pair a quarterback with his top receiver, for example, you’ll typically create a lineup with a lot of upside. The caveat is that strategy also increases risk. Thus, handcuffing isn’t a smart move in DraftKings’ head-to-head leagues. There are other player combinations that might be of use to you, though, such as playing two running backs in the same game. One of their teams will win, meaning that back will probably get a lot of late carries. In that case, you’d be sacrificing upside for consistency. On an individual level, we have a lot of awesome data on player consistency that can help you choose the right players. The RotoGrinders Player Consistency Dashboard shows you how often players have met certain benchmarks, along with projections of their high and low production for a given game. That information is invaluable when creating lineups. We also have a RotoAcademy lesson on ceiling, consistency, and floor stats. In almost all cases, you want to seek consistency in small leagues and volatility in big ones. 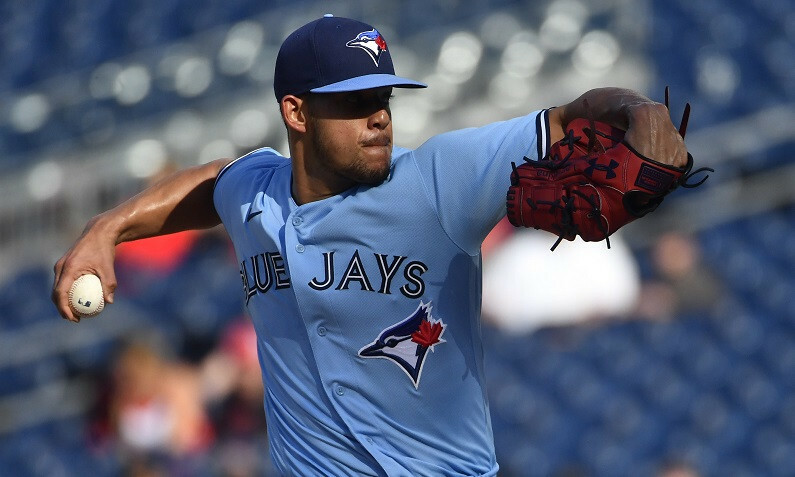 Since DraftKings is known for their tournament and GPP selection, it’s most important to understand how to approach large-field leagues. In addition to emphasizing upside with certain player types and combinations, you should also use a “contrarian” draft strategy. That means going against the grain, finding unique values who others won’t have in their lineups. If you can hit on a player who isn’t in a lot of lineups, it can really propel you up the GPP leaderboards. We have an entire lesson on contrarian thinking. Wow, incorrect information that is a year old…I think I will get my paid research elsewhere, thanks!